“The Bold and the Beautiful” spoilers for Monday, January 4, tease that Liam (Scott Clifton) will immediately call 911 and get some paramedics headed over to the mansion. Once again, Steffy (Jacqueline MacInnes Wood) looks unbelievably guilty after an altercation with her cousin. 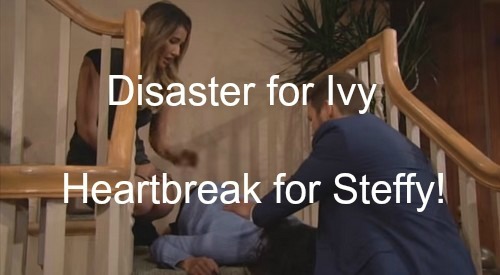 Ivy (Ashleigh Brewer) tripped and fell down the staircase, but Liam will still blame Steffy for confronting Ivy when he told her not to. Steffy’s actions aren’t necessarily causing all of Ivy’s mishaps, but they’re certainly contributing to them. If Steffy had just stayed away, Ivy would’ve hopped a plane to Australia and everyone could’ve moved on. Ivy might’ve been cozying up to a Liam lookalike in the land down under by now. Unfortunately, Steffy couldn’t resist going one more round. Liam won’t be pleased by Steffy’s rage or the pattern he’s seeing. “The Bold and the Beautiful” spoilers indicate that Liam will realize Ivy is breathing, but she’ll be out cold. Steffy will panic and try to help Ivy, but Liam will snap that she shouldn’t touch her. It’s clear that Liam is pretty upset with Steffy at the moment. Liam will likely wonder how many times this scenario has to play out. Does Ivy have to end up dead for Steffy to learn her lesson? Liam will undoubtedly do everything he can to make sure this never happens again. Meanwhile, Pam (Alley Mills) will find out that Ivy is unconscious and she’ll start spreading the news. Quinn (Rena Sofer) and Wyatt (Darin Brooks) will go to the hospital to check on Ivy’s condition. Once they know Ivy is going to be OK, Quinn will offer her unique insight on this situation. B&B spoilers say Quinn will suggest that maybe everything is working out like it’s supposed to. Quinn is probably hoping that Liam “The Rescue Ranger” Spencer will bond with Ivy after coming to her aid. Liam could also distance himself from Steffy and open the door for Wyatt. In Quinn’s opinion, it’d be a win for everyone. Ivy would get the man she’s been pining for and Wyatt would get the woman who’s a better match. With Quinn’s assistance, Wyatt will have his chance to grow closer to Steffy. Will Quinn be able to play Cupid? Time will tell, but you can bet that Quinn will give this her best shot. Stick with “The Bold and the Beautiful” for updates on what’s ahead for Wyatt and Steffy. So B&B fans, what do you think about Liam siding with Ivy? Will Steffy lose Liam because of her impulsiveness? How will Wyatt react when he learns about the accident? Will things line up like Quinn plans? Let us know what you think in the comments below and don’t forget to check CDL often for the latest “Bold and the Beautiful” spoilers, updates and news. The Bold and the Beautiful Spoilers: Katie Betrays Bill Over Spencer Publication’s Maya Transgender Reveal? The Bold and the Beautiful (B&B) Spoilers: Steffy Overhears Liam Profess Love for Ivy – Furious Steffy Ready to Rumble!